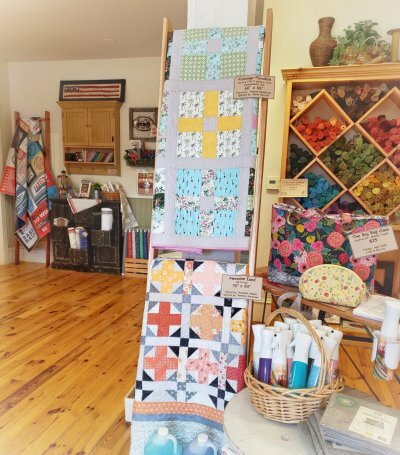 Utah Artisans Making Their Mark in the Quilting World. Is it possible to have too many quilts? Ahem... absolutely not. But this does beg the question, "How can I display all these beautifully stitched goods?" We have some new ideas for you, two of which are built locally by craftsman Hal Shelley of The Handcart Company. You have likely seen the functional new trend of layering quilts on a quilt ladder. This offers a clean, simple look that works well in any room, be it minimalist, rustic, farmhouse or traditional. Hal will make one just for you in the height and finish of your choice at $15 per rung! Stop in to see some examples. We can help you order right here at the shop. We are often asked how we prefer to display smaller projects. They are so fun to whip up, but what do you do with all of them? Hal came up with this fantastic display frame for his wife's wool work. It's perfect for this block from the Here a Chick, There a Chick quilt by All Through the Night! His attention to detail is wonderful. 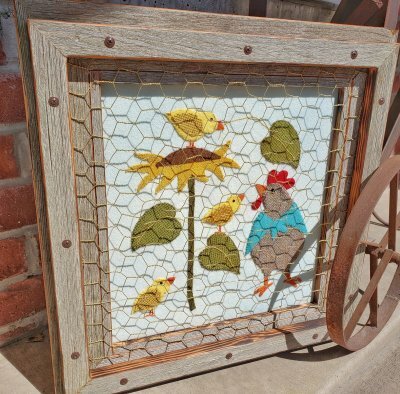 A layered barnwood frame is detailed with screw heads and chicken wire. We loved the idea so much we asked if he would make some for our customers to purchase here at the quilt shop and he graciously agreed. They are currently available for $49.99. How do you prefer to display your quilts? However you choose, be sure to rotate their location and refold from time to time to avoid fading and damaging creases that can weaken the fibers in those future heirloom creations. H Bag Class Coming Right Up! 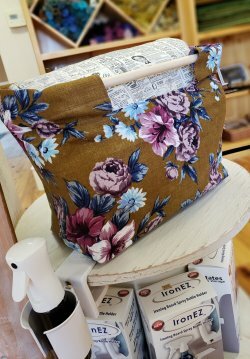 With no stabilizers or zippers, the H Bag by Orange Dot Quilts will probably be the easiest bag you make! A perfect class for beginning bag makers. The handles are dowels that are cut to length and provided at class. This bag is especially nice made from linen or decorator fabric. If you knit, crochet or want a bag to put a quilt in that you need to bind (like the full size quilt in the H Bag in this photo! ), this bag is it. Thursday, March 28th, 1:00 - 4:00 p.m.
Have you heard about Poppie Cotton? It's a brand new fabric company! Jina Barney and Lori Woods have joined forces, creating an exciting new brand. 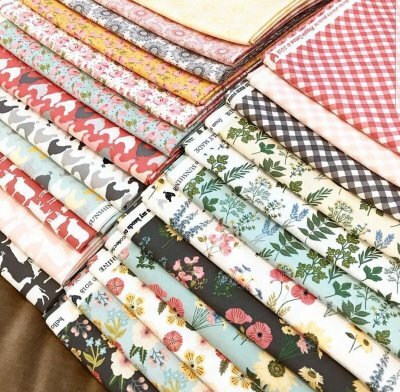 Their first fabric collection, Praire Sisters, has arrived in fresh farmhouse style! Gingham, sunflowers, chickens, florals and the prettiest seed packets you've ever seen are on our shelf by the yard. We're always happy to hear names familiar to our community making their mark in the quilting world! Stop in to see what this dynamic duo have in store for you. We even have their latest patterns and kits are coming soon! Summer is coming (I promise, it is) and with it always comes that crack of a baseball bat. From Riley Blake Fabrics (did you know they are a Utah based company?) comes the Varsity Collection. Along with small-scale sports prints, this line includes a 56" x 64" panel! 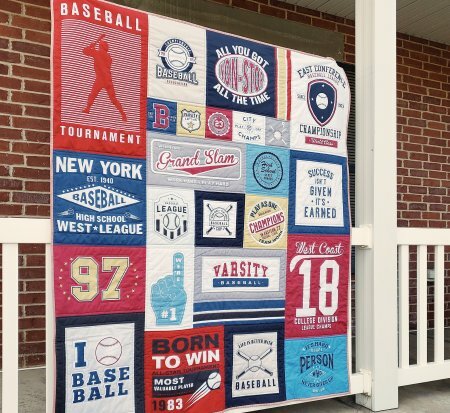 We simply added a super soft Cuddle backing, had Ramona Sorensen machine quilt around the baseball poster designs and bound it! Fabulous gift DONE! Of course we love that it is primarily Springville High School's Red Devil colors. Red Devil Pride! Monday, March 25th - 25% off regular price KITS!